We are a grass roots group formed to urge the Larimer County Commissioners to reject the City of Thornton’s 1041 pipeline application and, in doing so, join the citizens of Larimer County in supporting the health, vitality and survival of the Poudre River; our ecological and economic backbone. Instead of building a pipeline, Thornton could leave the water in the Poudre until it reaches a takeout point near Windsor where the Poudre crosses their southbound pipeline. The increased water flows would be significantly beneficial to the currently ailing health of the Poudre as it runs through Fort Collins, as well as to wetlands, environmental and recreational resources and the communities and businesses that depend on them. In denying Thornton’s pipeline, the Larimer County Commissioners will avoid not only disrupting our ecosystem, but also the citizens residing in the proposed pipeline route who would be harmed by dangerously limited access to their homes, devaluing of their properties, and the protracted destruction of their roads and communities. We are a self-funded community group asking for donations to help defray our costs of publicity, yard signs and legal advice. We are deeply thankful and grateful for any help you can provide. The July 9 County Commissioners Hearing on the Thornton Pipeline was forced to continue to a second night (July 23), since 72 people signed up to speak. The room was packed, standing room only with over 300 attendees. The county has received 2500 emails on it since the planning commissioners hearing on May 16! 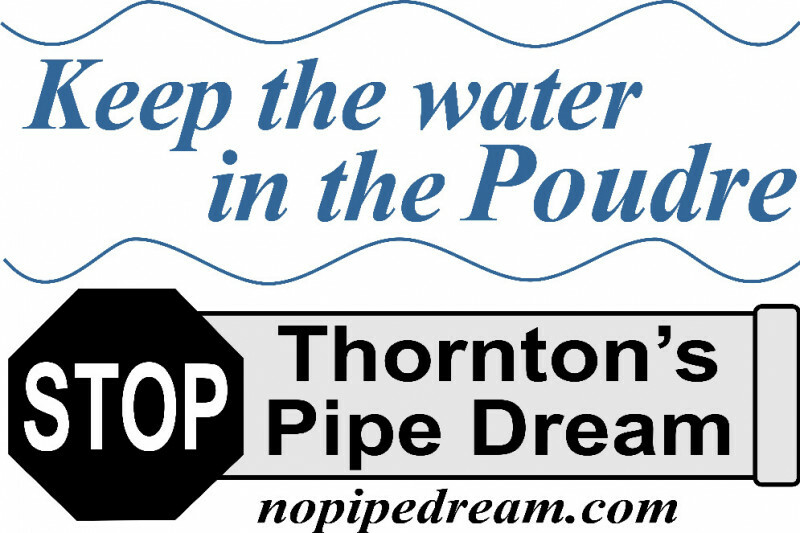 •	To watch the July 9 hearing, visit our website and click on the link on the homepage—Nopipedream.com. Our lawyer John Barth, opens up the public comment and was excellent! •	We are bringing John Barth back to speak on our behalf on July 23--the final hearing. Please consider donating to cover this extra expense. Now is our last chance to be heard. Thank you! Hello No Pipe Dream Supporters! We are so pleased that the planning commissioners voted against the 1041 application! Our lawyer did a great presentation--and the big turnout--helped to strongly influence the vote. Now we face the final hurdle--the County Commissioners hearing on July 9. If we can get this rejected, then the chance of them exploring the river route versus a pipeline will be greatly enhanced. We want our lawyer to present again, but to do so we need more funding support. Could you give, or give again? Everything helps. Thank you so much. We’ve been working hard to strengthen our stance AGAINST the Thornton Pipeline under Douglas Road and FOR further exploration of the Poudre River to carry the water through town to where it heads south near Windsor. We are working towards a regional solution. We are in contact with local business owners and organizations to encourage everyone to work toward the most positive outcome--keeping water in the Poudre River through town. The increased flows will not only enhance the health of the river and the wildlife that relies on it, but also give a boost to recreationists who use it to fish, swim, paddle board, kayak and tube. To this end, we’ve hired a water civil engineer to do a high-level analysis of the cost of the Poudre Alternative, and to review water quality data. We hope to have results soon. Simultaneously, we’re gearing up to present a legal statement against the new 1041 application. We are at $10,695 of our original $15,000 goal, which is great! Thanks to all who have supported us thus far. We raised our GoFundMe goal to $25,000 to cover our legal response to the new 1041, and the cost of the civil engineer for mapping out details of the Poudre Alternative. Can you help us make it? Please give here, or send a check to PO Box 2645, Fort Collins, CO 80522. THANK YOU! Your support makes it possible to challenge this short-sighted pipeline plan and promote the water staying in a natural pipe—the Poudre River through town. Without your help, we couldn’t fight this effectively. Remember, Thornton bought the water, but they did not buy the quality of the water, or a designated route to get it to them. Let's put Fort Collins first! Thank you so much to all who have given! Your generosity and community support for our efforts to "Keep the water in the Poudre" is moving our mission forward by leaps and bounds. We reached our original goal of $5000 to pay for the preliminary work of having Thornton's 1041 Permit Application professionally evaluated. As a result of the evaluation, specific areas of deep concern were identified. Additional in-depth research is now being done targeted to those specific areas, so that a comprehensive report can be presented to the Larimer County. The additional hours to fund these researchers cost additional money. It is because of that need, which was unknown to us when we started this journey, we are having to raise a bit more. We appreciate your continued support as this challenge unfolds and look forward to the day when we submit our report to Larimer County and hold the City of Thornton accountable!